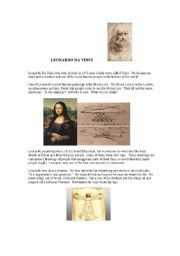 A short biography of Leonardo da Vinci , with some reading comprehension questions on the second page. Popular Sayings/Idioms and the situations in which to use them. 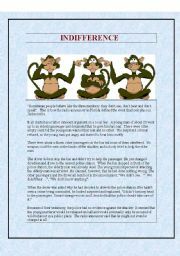 A matching game between 22 popular sayings and the situations in which they might be suitable. 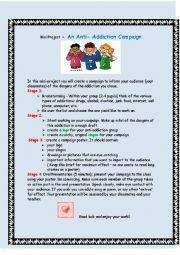 for Intermediate and advanced learners, for individual, pair or group work. A good way to learn,practice and remember these everyday sayings. 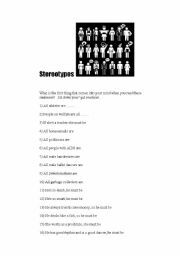 An activity which can be used to spark conversation about prejudice and discrimination. CAn lead to very heated discussion. 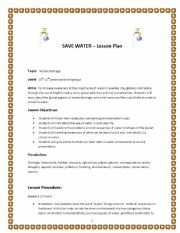 Can be used in ESL classes, social studies, etc. 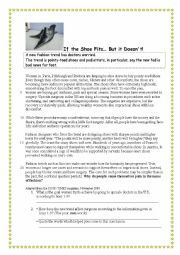 A reading comprehension exercise about how far people will go to follow fashion. It will spark conversation in class about fads, past and present, and what fad-conscious people are willing to do to look trendy. Suitable for high school and adult learners. What have they done to my Lisa?? 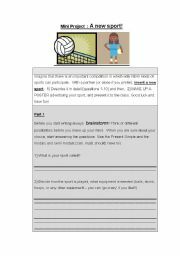 Mini Project: A new sport! 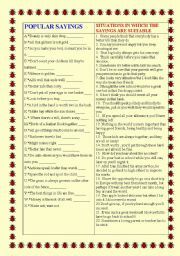 A fun 3-page worksheet for Friday 13th or to elicit conversation in class about superstitions. Can the students guess whether these situations bring good or bad luck? What is their significance according to believers in superstition? 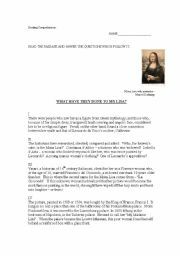 An answer key is provided .Suitable for all levels and all ages.